I took this pic back in February when we still had snow. 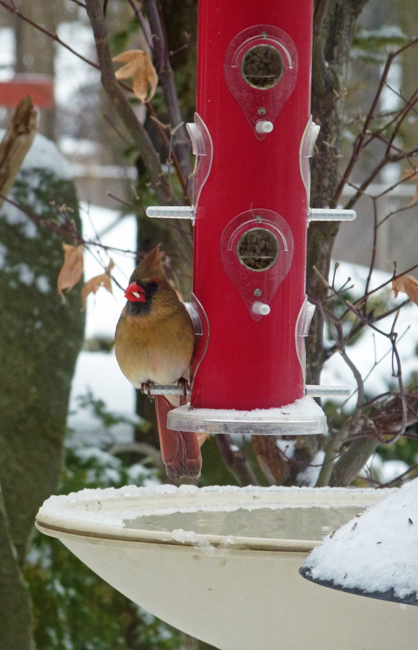 This lovely female Cardinal was having a bit of lunch and I caught her with her mouth full. The male Cardinals are so bright but the subtle tones of the females are wonderful. I'm not one to argue with you about the beautiful subtle tones of females! :) That's a nice shot. All the snow is gone now? Great photo. The female Cardinal is beautiful. Thank you for linking up and sharing your post. Thanks also for the comment. Happy Saturday, enjoy your weekend! Glad to see they have food too. Have a Happy WE, Pat! That is certainly a pretty girl! It's a whole new version of "ladies who lunch". Pretty girl is correct! Nice shot! I'm not sure if the cardinals have made it this far south yet. That is sweet and sleek! A beautiful bird! We don't see them here. Today's weather makes February look real good! Lindo um belo momento fotográfico. Pretty shot- still with the snow..I am seeing snow everywhere I go (in blog world) today! Creative and colorful photo of our feathered friend ~ the beautiful cardinal! They are really so pretty and soft looking. Subtlety, brilliance, subtlety, brilliance. If I were a cardinal I would know how to choose, but as a guy with a camera, I usually pick the males.